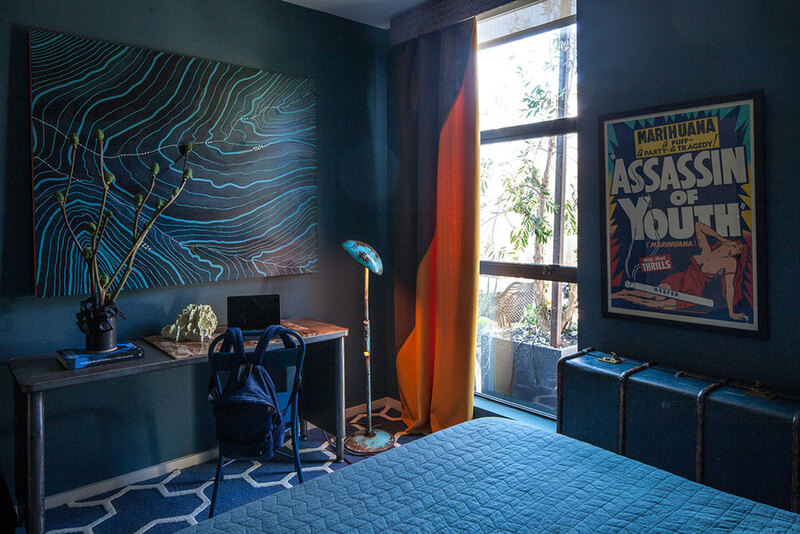 Basking in the glow of the Hollywood Hills, Eastown introduced 300 new units for the modern creative professionals flocking to the West Coast in late 2014. Interior Architectural firm Commune, known widely for giving Ace Hotels their signature shine, came onboard to elevate the spaces with contemporary touches - cork flooring, layered ply cabinetry, and graphic tile work throughout. Inspired by this fresh, new style of LA living, WCIP took over a 2 bed, 2 bath unit - sporting an oversized terrace with million-dollar views of the iconic Capitol Records building and an endless supply of cinematic sunsets. Using dynamic mid-century statement pieces, we wrapped the rooms in a rich, saturated color palette, complimented by a subtle narrative of simple shapes that permeated playful artwork, mirrors, and locally built furniture. The terrace became a collection of outdoor rooms, shaded with specimens from California, Africa, and Australia - complete with an interactive LED-activated wall hanging from Italian design firm Carnovsky. Custom built couch, designed by We Came In Peace. Pillows by Christian Rathbone and Cloudhunter. Rug by Calvin Klein Home. Kitchen island and industrial lighting designed by We Came In Peace.